I dunno what you did yesterday, but I watched a few movies that seemed fitting considering the holiday. It was my first time to see these, too. I had actually planned to finish off the evening with Evil Dead II, but I just didn’t get to it. Pity. Anyway, here they are, and here’s what I thought. It didn’t inspire the genre. That was Psycho (1960). And it wasn’t the first true slasher movie. That was Black Christmas (1974). 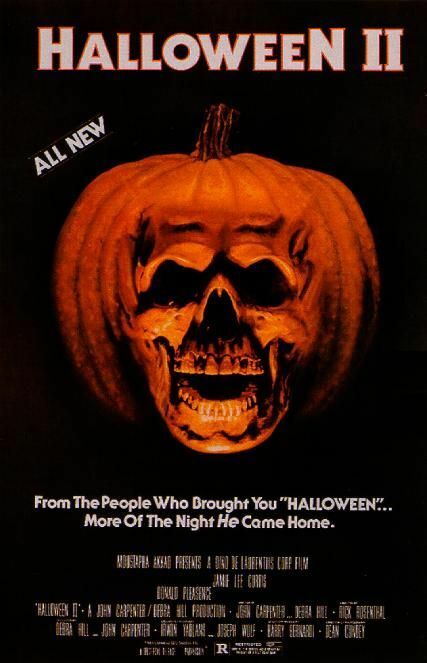 But when John Carpenter’s Halloween burst onto the scene in 1978, it pretty much ignited the craze that would last for over a decade while establishing the hallmarks of its legions of imitators. Even the critics liked it . . . this was, of course, long before they’d been made to sit through more of what Ebert would come to call “dead teenager movies” than they could ever have conceived of or imagined. In Halloween, little Michael Myers stabs his sister on Halloween night in 1963 and is carted off to a mental institution. 15 years later, he breaks free and returns to his hometown to go on a killing spree, recreating and expanding on his previous crime. Jamie Lee Curtis plays Laurie Strode, the “Final Girl,” in her breakout role. Donald Pleasence provides the star power, such as it is, playing Dr. Loomis, Myers’ psychologist and arch-nemesis. He went on to reprise the role in 4 out of 5 sequels. As movies go, Halloween isn’t too bad. It’s reasonably well made, considering the shoe-string budget, and employs some very sophisticated techniques. As scary movies go, my thoroughly desensitized viewing pegged it as only slightly scarier than Psycho. I love Psycho, I don’t love Halloween. Both have their campy elements, and both have endured for quite some time with a very devoted fan base. To my mind, I’d say the key difference is perhaps target audience. Psycho is perhaps a more serious and innovative psychological thriller, while Halloween is basically a filmed version of the sorts of stories teens tell each other at slumber parties and around campfires. Not bad, but I’m not by any means a fan. 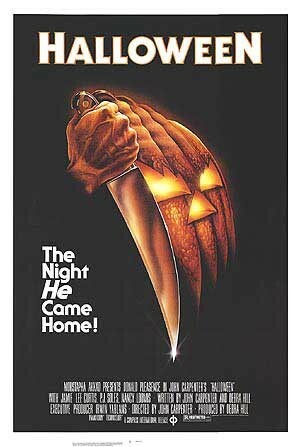 Carpenter wrote the script for Halloween II, which came out 3 years after the runaway success of its predecessor, but declined to direct. It begins seconds after Halloween ended . . . actually it re-runs the final scene to jog your memory . . . and the major players return to reprise their roles. Dr. Loomis runs around all over town, hunting for Myers, while Myers picks off the staff of the hospital that Laurie has been taken to one by one. Needless to say, this sequel was not nearly as well received as the original, and for good reason. It relies heavily on what Ebert calls “an Idiot Plot,” i.e. a plot that requires its characters to act like idiots to keep it moving forward. I wasn’t scared, I was mind-numbingly bored. Not even the adrenaline-packed final 15 minutes could prevent me from wishing the movie was over. Too little, too late, and the less said about it, the better. 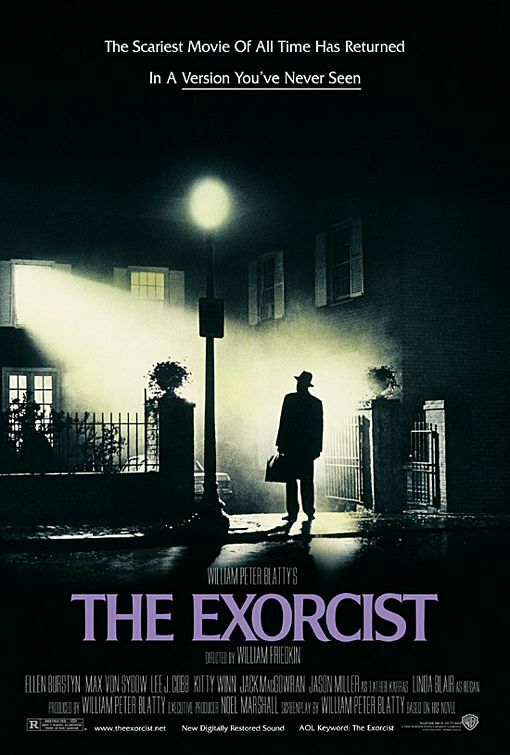 Can their be any doubt that The Exorcist is the definitive scary movie? Has any story more deeply terrifying ever been committed to film? I don’t know . . . but I hope not. I’m probably a bit biased, of course. I’ve been terrified of demonic activity since a traumatizing chapel experience when I was in the 3rd grade. But not only is The Exorcist a very scary movie (perhaps because it takes its subject so very seriously . . . whether you believe in demons or not, The Exorcist makes you feel that its creators certainly do), it is also an extremely good movie. It was actually nominated for Best Picture of 1973, although it lost to The Sting. Two subplots run parallel to each other for much of the movie before joining up near the end: Regan (Linda Blair), the possessed girl, and her mother (Ellen Burstyn) see every scientific and medical specialist anyone can think of, and while all of them are quick to suggest an explanation for what clearly seem to be supernatural symptoms, none of them can adequately explain what is going on. Meanwhile, Father Damien Karras (Jason Miller), a Catholic priest who also happens to be an expert psychologist, feels that his faith is slipping away. He reluctantly agrees to investigate Regan’s case to determine whether an exorcism is called for, but the possibility that she might actually be demon-possessed is completely implausible to him. Watching him gradually realize that this is really happening is riveting viewing. And, if all that weren’t enough, Max von Sydow shows up as the title character for a climactic spiritual showdown that is second to none (and, like the rest of this movie, certainly not for the weak of stomach). ~ by Jared on October 31, 2007.